The Amateur Radio Club of Columbia County, Inc. meets on the Fourth Tuesday of each month at the Columbia County Emergency Operations Center located at 650-B Ronald Reagan Drive, Evans, GA 30809. Fellowship begins at 6:30 PM with the meeting starting at 7 PM local time. One does not have to be a member of the Amateur Radio Club of Columbia County, Inc. to attend these meetings, just have an interest in the Amateur Radio hobby. Below is an aerial view of the meeting location with parking and entrance highlighted. You may click on the photo for a larger view. 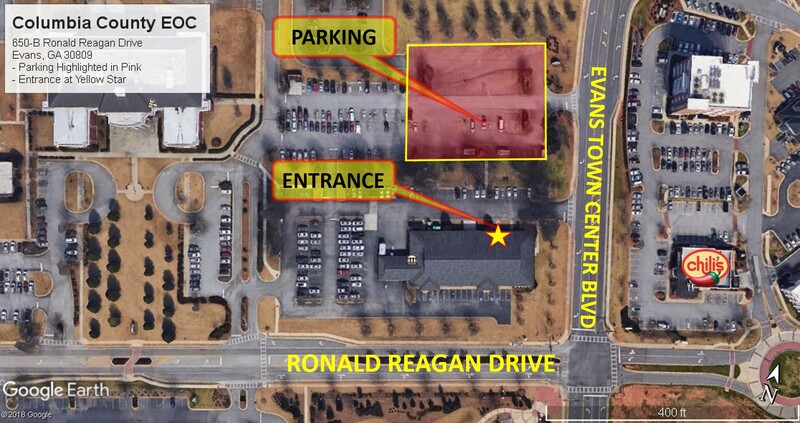 Please park in the rear of the EOC in the Justice Center Parking Lot which is highlighted in pink in the photo below and enter through the rear door of the EOC which is indicated by a Yellow Star.